Today is the Feast of St. Francis. 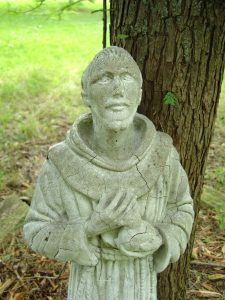 It’s probably a good day to post a story about an encounter with St. Francis I had a few years ago. It took place on a dusty outcropping overlooking the Palo Duro Canyon in the panhandle of Texas in the United States of America. It was there, on a star lit night, I met my old friend. Francis had tried to contact me over the years but I never responded to his overtures. You see, I had become one of his followers and lived with other followers of his for almost two years, and well, sometimes, “Franciscanism” can burn Francis out of you. Especially if you are a restless and sensitive soul. At any rate, I was hurt by a number of experiences and didn’t respond to my friend’s overtures of reconciliation; until now. When I left the Franciscans, I never really wanted to talk with Francis again. And yet, here he was in a sandy desert in Texas. Eager to talk. His presence was triggered by a book I had stumbled upon. I was still surprised. It was the book that, many years ago, began my love affair with Francis and the things Francis loved. Poverty, prayer, joy in simplicity, sanctity, and a radical foolish yes to Christ were the things Francis loved. His enthusiasm sparked mine. It was bolstered by youthful idealism. To see Christ in everything; in every flower, in every person, in every experience, in every leper, and in every song sung with purity of heart became for me, like it did for Francis many years earlier, my experience. My love for Francis was deep and it was a sad loss for me to let go of the friendship many years ago. This book I stumbled upon reminded me of many youthful and idealistic conversations Francis and I had back in days gone by. Francis’ joy and his intimacy in God lead me to desire this joy and intimacy. Many memories returned and I missed my old friend. I almost yearned for his friendship again. Over the years, in his attempts to rekindle the friendship, he told me I needn’t abandon him even if I needed to abandon the Franciscans. Our friendship could still continue, he suggested. The communion of saints and all that sort of thing, he mentioned. As my life after the Franciscans unfolded, he would make himself present in a variety of small but real ways. Always on the periphery guiding but not intrusive. Simply present. My heart was broken by the reality of luxurious buildings, personal conflicts, rationalizations and assorted other disappointments. I had no interest in remaining friends with Francis. He understood. It was a sad and silent goodbye. It was one of those partings filled with much love and that’s why they hurt so much. I never responded to his attempts to renew our friendship over the years. Until, as I say, this night. This little book, by Murray Bodo, reminded me of my friendship with Francis and in the early evening after the sun had set and the crickets kept the long horn cattle company, Francis appeared again. We sat together before God and His natural handiwork for a long while. In the silence. In the darkness. Under the Texas stars. Then he mentioned Our Lord and his poverty, and his chastity and his obedience and his cross. He mentioned the joy and freedom found in all this. He mentioned the beauty found in solitude. I was stunned by his frankness. Francis always has a way of getting to the heart of the matter. I listened. Eventually, I slowly warmed to my old friend as my heart opened and I was grateful to renew our friendship. I wept a bit in front of my old friend, Francis – Francesco. It was healing. I knew going forward our relationship would be different. Less formal. No fancy tunics or cinctures. No burdensome institutional labyrinths. Just he and I living the journey in simplicity, purity and fidelity. I told him it was likely I wouldn’t be perfect. He agreed with that and said he enjoyed my company and friendship anyway. He encouraged me to forgive myself and to forgive others that had hurt me especially in the Franciscans. This was difficult. He also encouraged me to ask forgiveness for those I had hurt. That was even more difficult. Pride said I need not look in that direction. After some time, we began to laugh. Yes, to really laugh, heartily. We told stories and laughed some more. How comfortable the chill of the desert felt with his presence. He gently helped me to see my part in my departure from the Franciscans. Seek the truth, he encouraged. I needed this gentle clarity. I understood with greater awareness that maturity, my growth in maturity, takes time. I became more aware of the disparity between ideals and reality. And then another figure approached in all this laughter and sharing. And it was Him for whom our hearts burned – in all his humanity. He too sat down with us by the edge of the Palo Duro Canyon and these three friends began to laugh. To really laugh and to tell more stories. Stories seem to unit us, don’t you think? How full our hearts were. This, this is the man for whom Francis danced. I understood just a little bit more. How strange it was to be so free of all kinds of “churchy stuff” and we were just laughing and learning about love. My heart was softened and I was grateful that on a dusty outcropping overlooking the Palo Duro Canyon, I reconciled with an old friend who remembered nothing of our falling out and only wanted to enjoy a friendship with me and re-introduce his friend, Jesus, to me, again. Shortly after that, I awoke. Or did I? After experiencing the encounter highlighted above, and feeling the closeness of God and Francis in the panhandle of Texas, the next day was a little less joyful. You see, as the sun was rising in East Texas and I was driving along Route 60 headed West, a young driver fell asleep at the wheel of her van and slammed directly into the back of my Nissan Versa. She was traveling at least 80 miles an hour. She and I, thank God, were mostly unhurt but my car was totaled and I was in shock. Why do I add this P.S. to my post? You see, the address on the business card of the tow truck driver who removed my squashed car from the highway was St. Francis Avenue. Was the renewal of friendships the night before this accident a dream or did it all really happen? For certain, the accident and tow truck were very real. Coincidence or God-incidence? You decide.